Better, but not great. I think the gray is just too low-contrast. 1. Just deal with it. Knit up the sweater as shown in Figure 2, and let it go. 2. 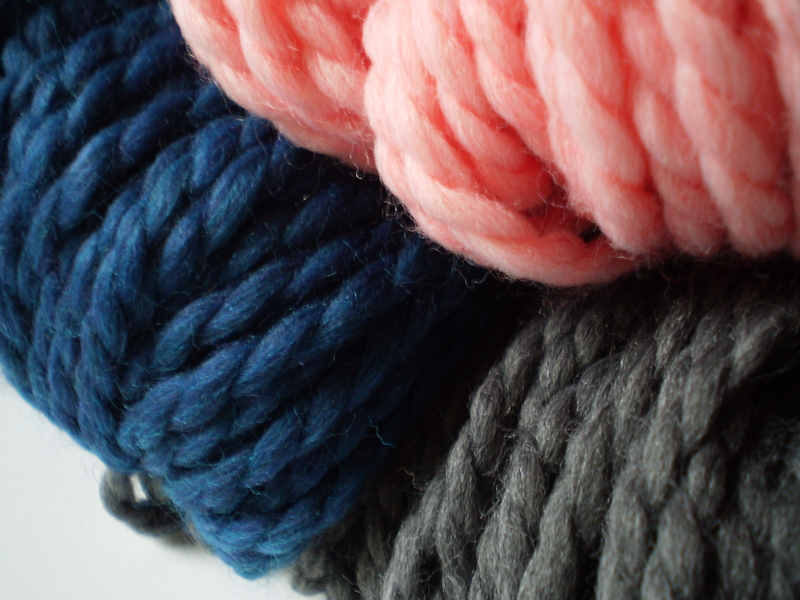 Forget about trying to use both gray and pink, and just make the sweater out of pink and blue yarn. 3. 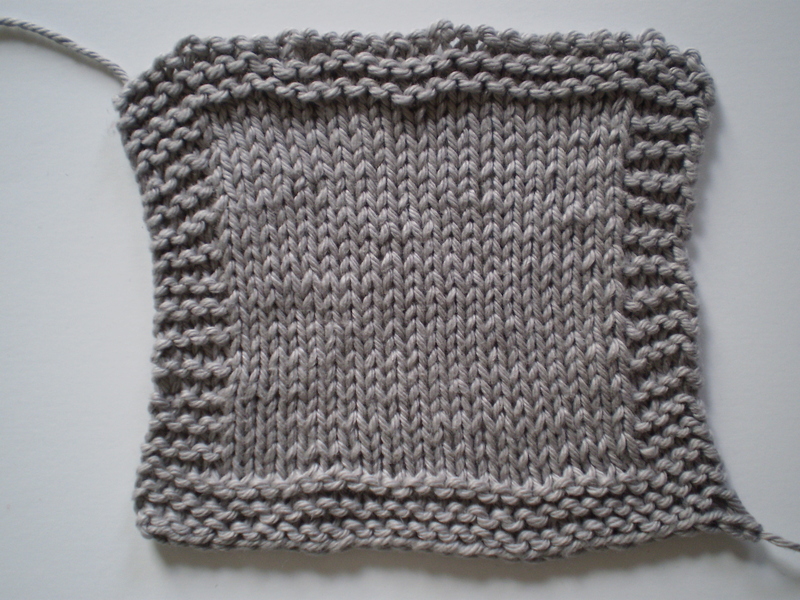 Order more gray yarn from Knit Picks in a lighter shade. This entry was posted in FYI and tagged blue, cardigan, colors, grandma, grandmother, gray, pink, shade, swatch, sweater on October 15, 2014 by onemilljellybeans. Grandma, Don’t Read This Post! I’m 99.9% sure that my grandma doesn’t have the internet any more. I believe she got rid of it a couple months ago. That being said, if I’m wrong: Grandma, stop reading! Christmas spoilers are ahead! You have been warned. OK, it should just be us now. Remember last January when I made a sweater for my grandfather? Well, this summer Grandpa asked me to make a sweater for my Grandmother, too. He asked for something similar, but blue, and well, I can’t say no to a request like that. 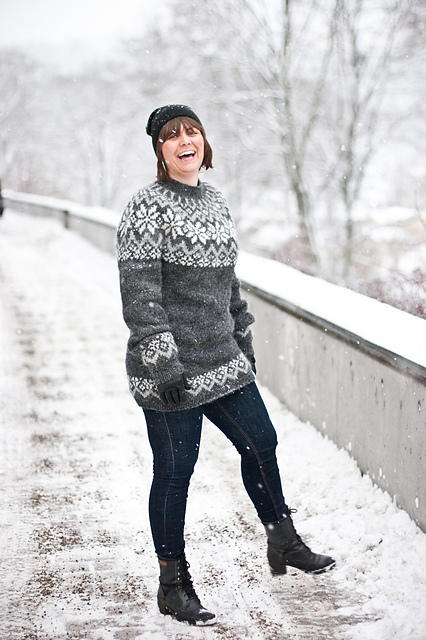 I’ve decided to knit up a Norwegian-inspired sweater for Grandma this year. 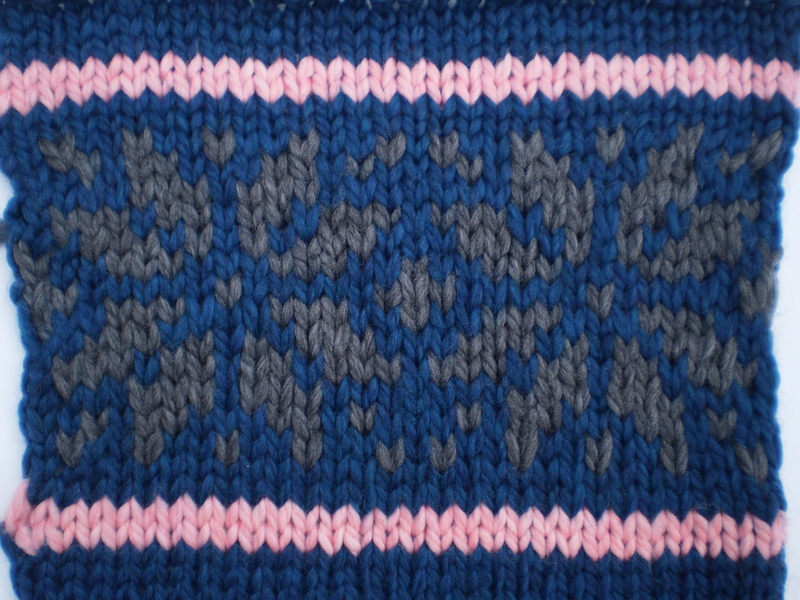 I’m thinking a top-down, yoked sweater (because I love making top-down, yoked sweaters). I’ll include a Norwegian star/snowflake pattern across the shoulders. And, because that’s basically all she wears, it’ll be a cardigan. The next step was to pick out yarn. I am a big fan of Knit Picks (as a naturally frugal person), so I decided to give their Biggo yarn a try. I have worked with it before, and it is lovely, soft, super thick, warm, and washable. (Since there’s only three months until Christmas, having a big gauge is especially important.) Mom and I talked about colors, and we settled on Sapphire Heather (main color), Dogwood Heather, and Cobblestone Heather. I think these colors look lovely next to each other. Unfortunately, there isn’t as much contrast between the Cobblestone and the Sapphire as I would have liked. But, sometimes colors look different in the skein and knitted up, so I’ll need to work up a swatch to see how the colors play together when they’re knit up, just in case I need to get a different gray color. I’m itching to get started knitting up this sweater. I can’t wait to see how it goes. (But unfortunately, I have to wind up all the skeins into balls, first, or I will spend the next three months fighting with big tangles of yarn. Woe is me. 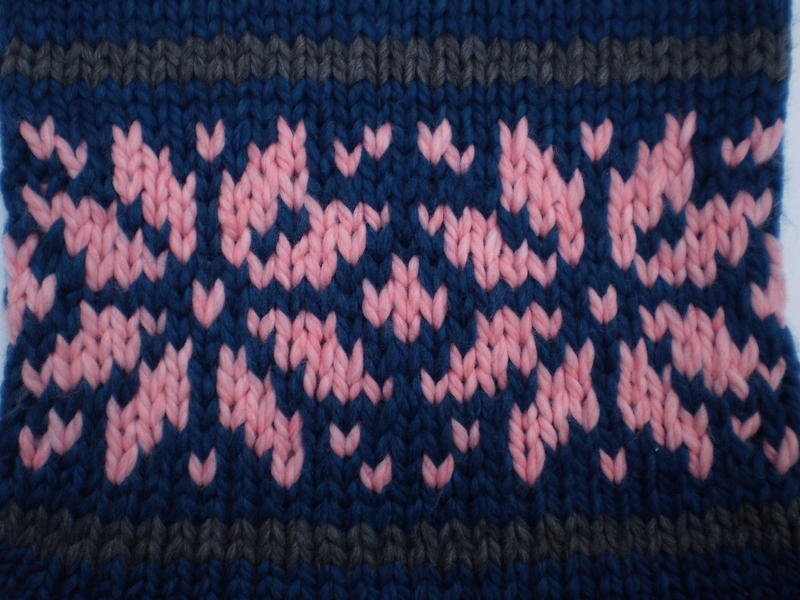 This entry was posted in FYI and tagged blue, cardigan, christmas, gift, grandma, grandmother, gray, norwegian, pink, star, sweater on September 26, 2014 by onemilljellybeans. 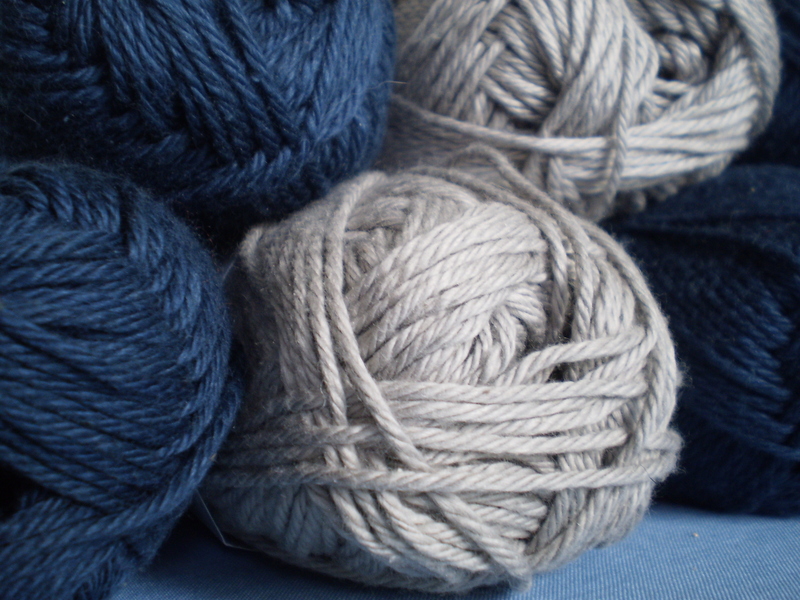 Anyway, Jenny pulled out her needles and several shades of blue and gray yarn. She whipped up a couple little garter stitch squares and put her knitting back in her bag. I was curious what she was making, and she said she was “Knitting the Sky.” I had never heard this concept before, and had her explain. 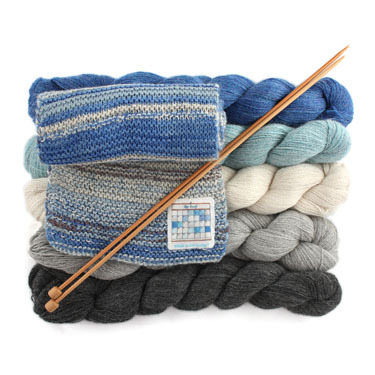 Apparently, Knitting the Sky is the idea that you put aside a few minutes each day to look at the sky and then pick a yarn color closest to the color of the sky to make an afghan square, or a few rows of garter stitch to add to a scarf. As far as I can tell (and correct me if I’m wrong), the first person to do this was Leafcutter Designs. They sell a kit (yarn plus directions) to make a Sky Scarf. 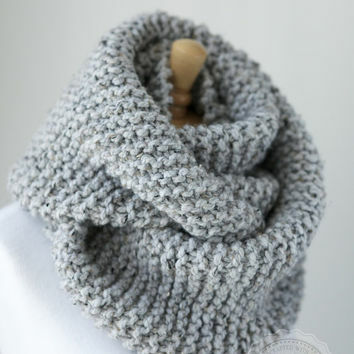 It’s a simple garter-stitch scarf, but the subtly shifting grays and blues make the scarf look almost like it’s made with hand-painted yarn. 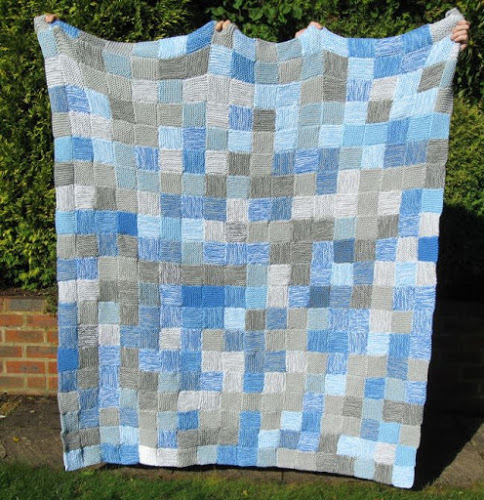 But Jenny is an overachiever (in the best possible way), so instead of just making a sky scarf, she’s making a sky afghan, like this one. How beautiful is that! Who could have imagined that wrapping up in cloudy and rainy days could be so cozy? And, imagine extending the idea of using a color to represent a day in other projects. 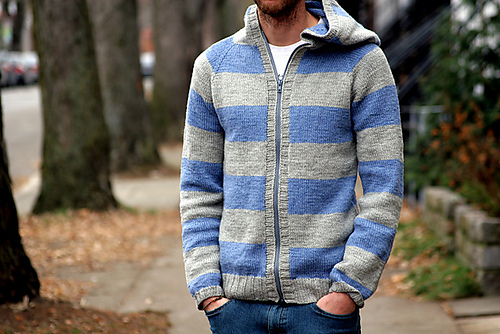 How about a striped cardigan that shows your mood each day for an entire year? Or what about a pair of mittens that represent what you ate for breakfast for a month? OK, I’m getting silly now. But, the point still stands. This is a fantastic idea, and a great way to get some knitting in while getting more in touch with the world around you. Too bad that if I was to make a sky scarf it would end up being a uniform Seattle-gray. This entry was posted in Inspiration and tagged afghan, blanket, blue, garter, garter stitch, gray, knit the sky, knitting the sky, scarf, sky on September 10, 2014 by onemilljellybeans.